Motherwell had met the Mexican actress during his 1941 trip to Mexico. Initially they lived on Motherwell's $50 weekly stipend given to him by his father. Prior to going to Mexico Motherwell lived in what he described as "a thing called the Rinelander Gardens which were beautiful old iron-balconied buildings on Eleventh Street. I had a big room and a balcony and the garden in front." Early 1942: Barnett Newman asks "What about Isolationist Art?" The text written by Newman was unpublished at the time. In the document Newman compares American isolationism to Hiterlism and blames the artists for succumbing to isolationism through Regionalism or American Scene painting. Early 1942: Peggy Guggenheim marries Max Ernst. Peggy's cousin Harold Loeb and his wife were witnesses at the civil marriage ceremony that took place in Virginia. January 1942: Barnett Newman applies for conscientious objector status. 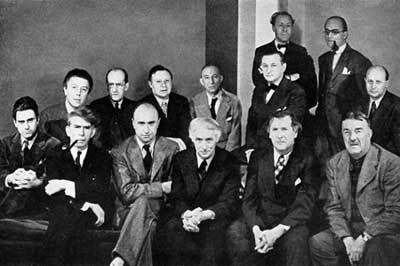 January 19, 1942: Artists' Council for Victory is formed. January 20 - February 6, 1942: Jackson Pollock shows Birth in "American and French Paintings" exhibition at McMillen Inc.
January 21-March 8, 1942: "Americans 1942: 18 Artists from 9 States" exhibition at the Museum of Modern Art. January 1942: Macy's art exhibition. February 1942: The Federal Art Project becomes part of the War Services Program. February 4 - March 10, 1942: U.S. Army Illustrators of Fort Custer, Michigan exhibition at The Museum of Modern Art. March 1942: André Breton works for the Voice of America. 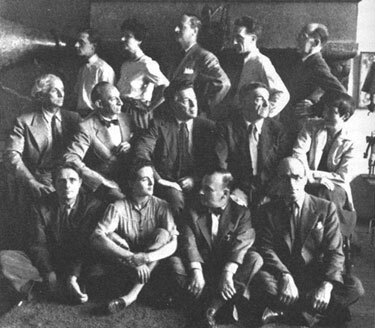 Other employees included Claude Levi-Strauss, Klaus Mann, Yul Brynner, Robert Lebel, Claude Lévi-Strauss, Denis de Rougemont, Georges Duthuit, Julien Green, and André Maurois. In his preface to the exhibition catalogue (which also included an essay by Nicholas Calas), James Thrall Soby indicated two possible directions for American Artists - either the acceptance of a "new internationalism" or a "xenophobic" reaction against the exiled artists ("and wait for such men to go away leaving our art as it was before.") Soby, of course, backed a new internationalism. The topic of a new internationalism was also taken up by Samuel Kootz when he wrote the text for the catalogue of a Byron Browne show at the Pinacotheca Gallery the following year (March 15 - 31, 1943). March 31 - April 21, 1942: Matta has his first solo exhibition in the U.S. at the Pierre Matisse Gallery. Among the works exhibited were Rain, The Earth Is a Man and Locus Solus. April 1942: André Breton discusses myths in the Max Ernst issue of View magazine. Spring 1942: James Johnson Sweeney visits Jackson Pollock's studio. Spring 1942: Jackson Pollock's mother visits Jackson and Sande in New York. Spring 1942: Wolfgang Paalen launches Dyn. April 8 - May 16, 1942: Franz Kline exhibits at The National of Academy of Design's Annual Exhibition. May 1942: Harold Rosenberg writes about myth in the Tanguy/Tchelitchew issue of View magazine. May 1942: Alexander Calder exhibition at the Pierre Matisse Gallery. 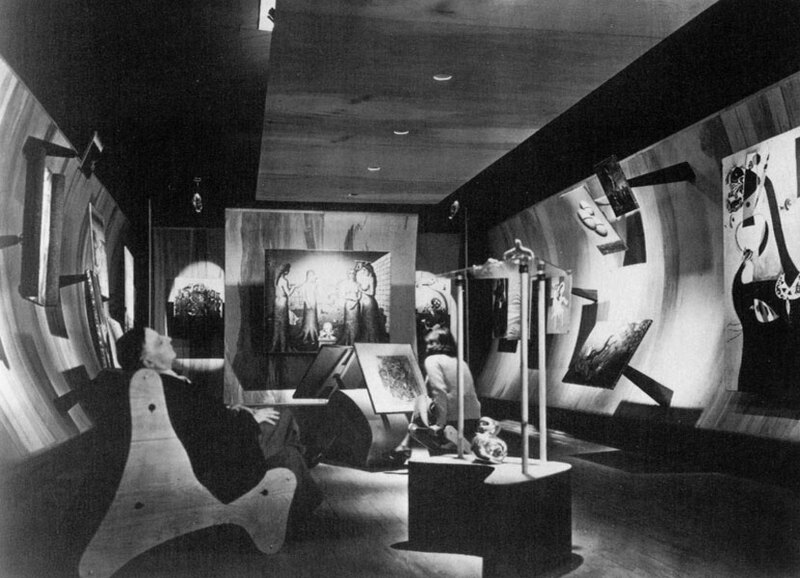 May 1942: Second annual exhibition of the Federation of Modern Painters and Sculptors at the Wildenstein Galleries. Adolph Gottlieb exhibited a Pictograph painting (Symbol) for the first time at the exhibition. Alfred Barr paid for the work by returning Gorky's Khorkum (c. 1938), which the Schwabachers had donated to the museum, and paying out an additional $300. (BA325) In June 1942 Dorothy Miller (then the assistant to Alfred Barr) asked Gorky to contribute a statement about the painting for the museum's files. The statement began, ""I like the heat the tenderness the edible the lusciousness the song of a single person in the bathtub full of water to bathe myself beneath the water. I like Uccello Grunewald Ingres the drawings and sketches for paintings of Seurat and that man Pablo Picasso." (MS242) Gorky makes no direct reference to the painting in his statement, which is mostly a poetic description of the "Garden of Wish Fulfillment" from Gorky's childhood (as quoted in "Arshile Gorky's Childhood"). May 6-June 16, 1942: Art Sale for the Armed Services at The Museum of Modern Art. c. Spring - Autumn 1942: Julien Levy serves in the Army. May 21 - October 4, 1942 Road to Victory exhibition at The Museum of Modern Art. The exhibition attracted 98,000 viewers. (SG89) Edward Alden Jewell reviewed it for The New York Times. May 1942: Peggy Guggenheim publishes a catalogue of her collection. 2,500 copies of the book were published which included photographs of the eyes of the artists next to their works and a selection of artists' statements. 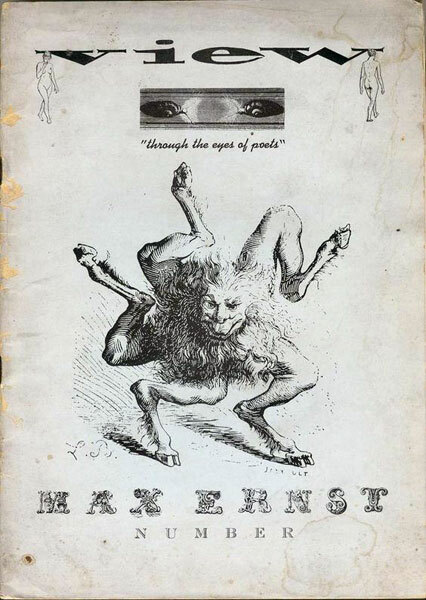 It featured a cover by Max Ernst and was printed partially in green ink, the color that Breton often used for his writings. Breton's essay "Genesis and Perspectives of Surrealism" was included. 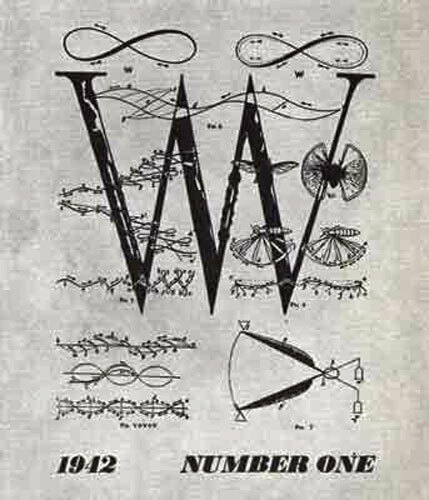 Late Spring/Early Summer 1942: The first issue of VVV magazine is published. Only three issues of the magazine would be published beginning with the spring 1942 issue. In a letter dated either May or June 1942, Matta wrote to Gordon Onslow Ford, "This winter in New York was a very hot one - all energies were lost in personal quarrels. I was fighting most of the winter for the publication of VVV; now it is at the printer's. André at full strength - sabotage of all the click around View (Calas, Seligmann, etc.). Abel, the editor, wrote a very clear program." I'll tell you what I remember - and there's a lot I don't remember... The Surrealists were proselytisers... They very badly wanted a vehicle here. By hook or by crook slowly some money was raised. The actual editor was André Breton who always was the chief of everything Surrealist. I think Marcel Duchamp and Max Ernst if I remember were associate editors. But the Surrealists had a feeling - not really realizing that artists in America are not taken very seriously - that they were politically radical, etcetera, they were aliens, exiles, etcetera, and that ostensibly there should be an American editor. There was also some effort to get some Americans to contribute. William Carlos Williams and so on. And so for a time I accepted the role simply to help them out. Then one day it became clear to me in an angry discussion in French, which I only partly understood, that they had also assumed that I had American connections and could raise some money. Which I didn't have, and couldn't. Then I got furious and resigned. And the compromise was that Lionel Abel and I co-edited. And then what transpired was that Abel, who had no job, no money, no anything, asked for the colossal sum of twenty-five dollars a week simply in order to exist while he was gathering the manuscripts and all the rest of it. And again, they got furious at that and fired him. Then I said, "I resign." Then David Hare who had, I think, an independent income agreed to be the nominal editor. Summer 1942: Max Ernst drips. Early Summer: Franz Kline works for the Army. Summer 1942: Robert Motherwell spends the summer in Provincetown, Cape Cod, Massachusetts. June 1942: Arshile Gorky visits his in-laws in Washington, D.C.
Summer 1942: Arshile Gorky sketches a waterfall in Connecticut. In addition to visiting his in-laws in Washington, D.C. in June, Gorky also stayed at Saul [in some sources spelled "Sol"] Schary's home in New Milford, Connecticut for two or three weeks during the summer. While there, Schary took him to see a nearby waterfall. Schary loved "to go down there and paint." Gorky fell in love with the spot as well and did drawings of the waterfall. The Gorkys also spent time at Crooked Run Farm in Virginia owned by the parents of Gorky's wife. The Waterfall painting has been attributed to 1943 and the Gorky's stayed at Crooked Run from about late May/early June to October 1943. (MS261) Although descriptions of the farm do not include a waterfall, there was a river there which "fascinated" Gorky. June 1942: Peggy Guggenheim stays in in Cape Cod. Peggy initially stayed in Wellfleet with her daughter, Pegeen, and Max Ernst but then moved to Provincetown where they shared a house with Matta who had been living there since May 1942. (SS220) The landlord of Matta's residence, John Phillips, recalled visiting the property and seeing Max Ernst dripping paint on to a canvas from a can. June 30 - August 9, 1942: "New Rugs by American Artists" exhibition at the Museum of Modern Art. August 1, 1942: Arshile Gorky receives his draft papers. August 12 - September 13, 1942: "Camouflage for Civilian Defense" exhibition at the Museum of Modern Art. August/September 1942: Lee Krasner moves in with Jackson Pollock. Autumn 1942: Robert Motherwell meets Jackson Pollock. 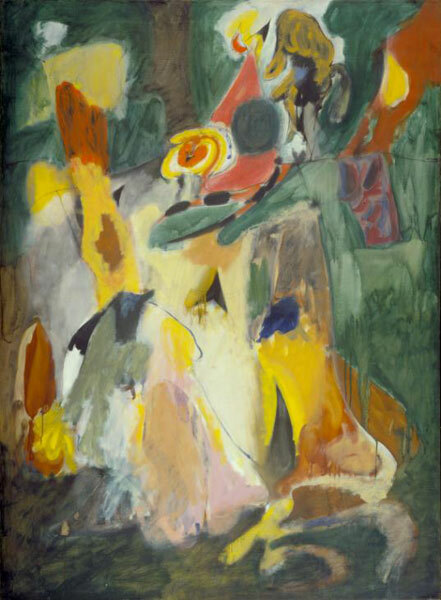 Autumn 1942: Matta practices automatism with Abstract Expressionists. Robert Motherwell helped Matta organize workshop type gatherings at Matta's apartment where the Surrealist technique of "automatism" was explored - a sort of painterly version of stream-of-consciousness writing where a painter painted instantly and automatically with the hope of achieving as sort of purity of abstraction not linked to subject matter - similar to what Pollock later achieved through his "drip" paintings. [Automatism] was a Surrealist technique but it had all kinds of possibilities... Klee used that kind of technique, although he was not really a Surrealist; Masson and Miro and Arp were all doing it... You see, what I realized was that Americans potentially could paint like angels but that there was no creative principle around, so that everybody who liked modern art was copying it. Gorky was copying Picasso. Pollock was copying Picasso. De Kooning was copying Picasso... I was painting French intimate pictures or whatever. And all we needed was a a creative principle... And I thought of all the possibilities of free association - because I also had a psychoanalytic background and I understood the implications - might be the best chance to really make something entirely new which everybody agreed was the thing to do. Solomon also mentions that "Surrealist parlor games" were played at the sessions such as "Male and Female" where a sheet of paper was passed around the group and each artist added something to it, resulting in androgynous fantasy figures. (JP124) Jackson Pollock's Male and Female (c. 1942), was possibly named after the Surrealist game. c. Mid-1942: Arshile Gorky applies unsuccessfully for a job at Brookline College, Massachusetts. October 1942: Lee Krasner and Jackson Pollock study sheet metal. October 1942: Marc Chagall exhibition at the Pierre Matisse Gallery. A cosmopolitan crowd of Manhattan art-lovers trampled each other's elegant toes last week to see an exhibit of paintings by Marc Chagall, one of the least known (in the U.S.) of important modernist painters, the man for whom the word Surrealist was first coined...Today Marc Chagall says of Surrealism "Not for me." A hater of realism as well, he refuses to be joined by any artistic school. He will not even discuss his own work. "Monsieur," he says in his dense Vitebsk French (he speaks no English), "l'art est comme l'amour. If your wife is ugly, you do not talk about her looks. If she is beautiful, they speak for both her and you." October 1, 1942: Mark Rothko's wife's jewelry appears in Vogue magazine. 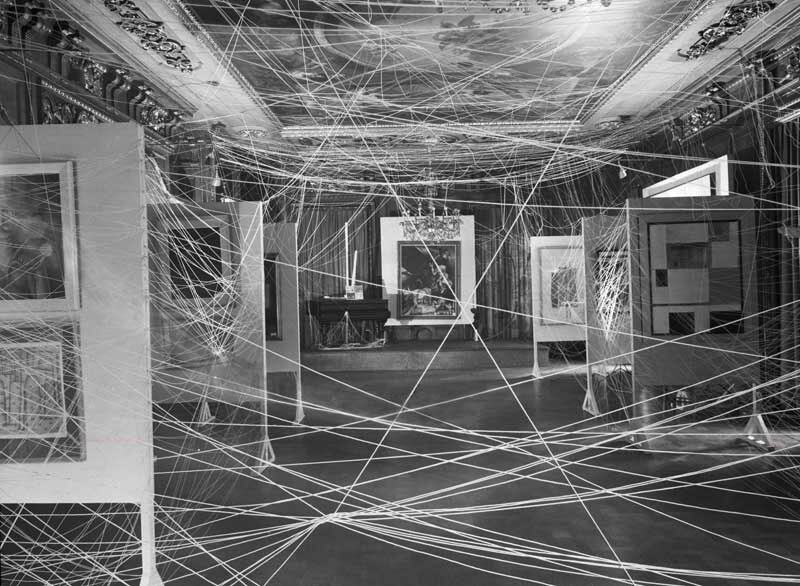 Organized by Pioneer Surrealist André Breton for the benefit of French prisoners of war, it [the exhibition]... had a striking installation: a cat's cradle consisting of miles of string woven all through one exhibition room. As an added attraction a number of schoolboys were employed to play catch with footballs over the labyrinth. Among the show's 105 exhibits, including dolls, idols, ceremonial masks by American Indian primitives, was work by painters Masson, Delvaux, Chagall, Tanguy, Magritte, Vail, Hirshfield. Of those canvases faintly visible behind the 7-ft.-high string cobweb was a huge new Freudian nightmare by Surrealist Ernst. Painted specially for the exhibition, Surrealism & Painting depicted a nest of multicolored bosomy birds, from whose naked, writhing limbs a semihuman arm emerged to paint its creator's conception of the disorderly universe. In the next room hung early canvases by de Chirico; also three recent Picassos, one of which, Les Femmes au Bord de la Mer, dwarfed, by its sheer creative power, every other painting in the show. October 19, 1942: Art Exhibition for the Benefit of Armenian War Relief at the Art Students' League. October 20 1942: Peggy Guggenheim opens Art of this Century. As art lovers emerged from dimmed-out Manhattan streets, they encountered a blinding white light. "That's day," said the patroness of Surrealism, Peggy Guggenheim, shielding her eyes from a mass of blue-white electric bulbs. "Isn't it awful?" "Day" illuminated a "painting library" (a large room enclosed in a sinuous purple tarpaulin), where art lovers were invited to sit on narrow, legless, armless rockers, and by turning unframed canvases hung from triangular columns, study the exhibits from any angle they desired. Such is the entry of a new museum opened last week for the benefit of the Red Cross by jet-haired Miss Guggenheim, wife of Painter Max Ernst. Under the name Art of This Century, Miss Guggenheim's four-roomed gallery (30 West 57th) is to be a permanent show. All owned by herself, the collection of 171 exhibits (14 by husband Ernst) is reputed to be the biggest of its kind. Beyond the painting library, gallery-goers enter a kind of artistic Coney Island. Here are shadow boxes, peepholes, in one of which, by raising a handle, is revealed a brilliantly lighted canvas by Swiss Painter Paul Klee. Another peep show, manipulated by turning a huge ship's wheel, shows a rotating exhibit of reproductions of all the works, including a miniature toilet for MEN, by screwball Surrealist Marcel Duchamp. Beyond these gadgets mankind swarms into what seems to be a decorated subway. There spectators gaze at large canvases by England's Leonora Carrington, Spain's Miro, Chile's Matta, all their works unframed, suspended in the air from wooden arms protruding from concave plywood walls. Every two minutes, while onlookers enjoy the spectacle, a roar as of an approaching train is heard, lights go out on one side of the gallery, pop on at the other. This installation is the creation of diminutive, Austrian-born Scenic Designer Frederick J. Kiesler, director of the laboratory of the School of Architecture at Columbia University. Says he, making everything plain: 'We, the inheritors of chaos, must be the architects of a new unity.'" November 1942: Howard Putzel writes to Onslow Ford about Jackson Pollock. December 9, 1942 - January 24, 1943: "Twentieth Century Portraits" exhibition at the Museum of Modern Art. The exhibition included Arshile Gorky's My Sister, Akho. According to his wife, Agnes, Gorky purposefully gave it an earlier date of 1917 "because he didn't want it hung next to the boys in the back room." (BA337) After his death it was renamed Portrait of Ahko. December 7, 1942 - February 22, 1943: "Artists for Victory" exhibition at the Metropolitan Museum of Art. The show consisted of 1,418 works by contemporary American artists. Jackson Pollock exhibited The Flame (c.1934-38) (PP320) The first prize for painting went to American regionalist John Stuart Curry for Wisconsin Landscape. (RO164) Other prize winners included Alexander Calder, Jack Levine, Marsden Hartley, Jacob Lawrence, Philip Evergood and Frank Kleinholz. December 28, 1942 - January 11, 1943: "Adolph Gottlieb: Paintings" at the Artists Gallery. The exhibition was the first solo exhibition of his Pictographs.